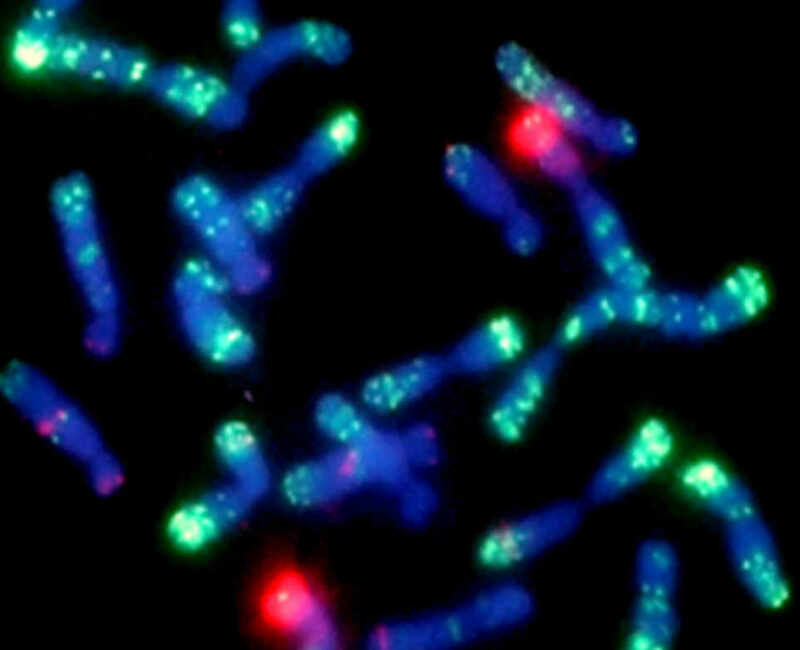 In situ hybridization, now largely with fluorescent detection so ‘fluorescent in situ hybridization’ or FISH, is a key method for localizing DNA sequences along chromosomes and occassionally within interphase nuclei. RNA in situ hybridization (not discussed here) is used for locating gene transcripts within nuclei. Chromatin Immunoprecipitation, ChIp, is used to isolate DNA still associated with protein to understand the key interactions between the two types of molecules. A recent commentary of ours discussed some of the uses of this in identifying the packaging of DNA in nucleosomes. The course participants made chromosome spreads from medicinal ginger, Bosenbergia rotunda, and banana. 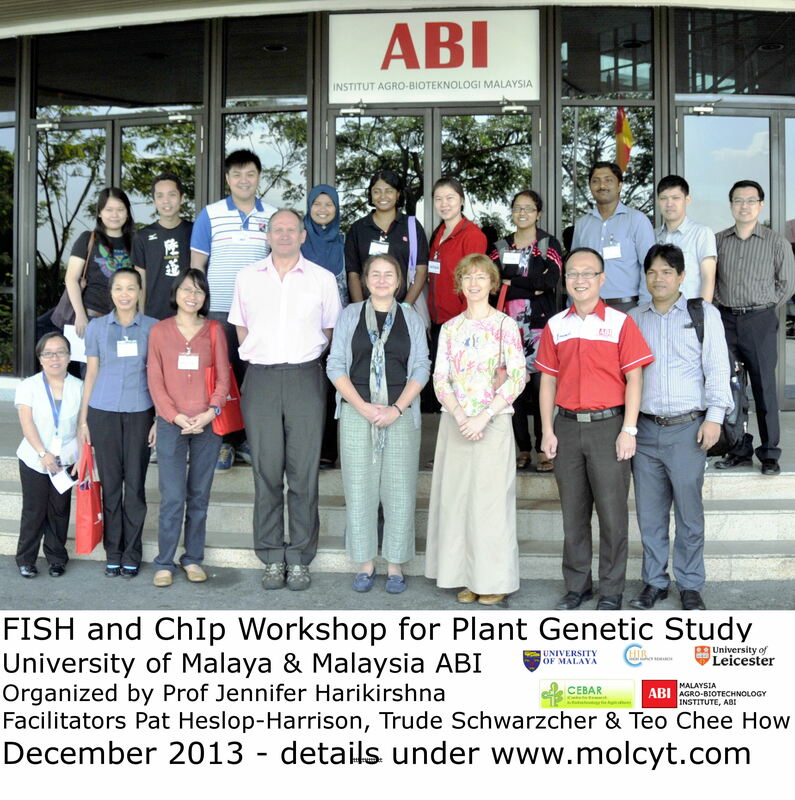 Both the course organizer, Prof Jennifer Harikrishna and one of the facilitators, Pat Heslop-Harrison, have been involved with sequencing the banana Musa balbisiana and Musa acuminata genomes in the past year. Crop improvement is reliant on the exploitation of new biodiversity and new combinations of diversity. I will discuss our work on genome structure and evolution, involving processes including polyploidy, introgression, recombination and repetitive DNA changes. Identification and measurement of diversity and relationships assists in use of new gene combinations or new crops, through synthesizing new hybrid species, by chromosome engineering or by transgenic strategies. We are studying crops including wheat, Brassica and banana, using genome sequencing, repetitive sequence comparison, and cytogenetics. Plants, pathogens and farmers have been involved in a three-way fight since the start of agriculture, and the concept of superdomestication involves systematic identification of needs from crops, only then followed by finding appropriate characters and bringing them together in new varieties. Crops will continue to deliver the products needed for food, fibre, fuel and fibre in an increasingly sustainable and safe manner. Some DNA sequences are recognizable in all organisms and originated with the start of life. Others are unique to a single species. Some sequences are present in single copies in genomes, while others are present as millions of copies. The total amount of DNA in cells of an advanced eukaryotic species can vary over three orders of magnitude, and chromosome number can vary similarly. How can such huge variations be accommodated within the constraints of organism growth, development and reproduction? What are the evolutionary implications of these huge variations? How can we use the information to understand plant evolution, cytogenetics, genetics and epigenetics? What are the implications for future evolution, biodiversity and responses of plants during plant breeding or climate change? This entry was posted in cereals, Musa, News, Species, Techniques and tagged ABI, bosenbergia, chip, chromatin, chromatin immunoprecipitation, chromosomes, course, crops, genomes, genomics, ginger, in situ hybridisation, in situ hybridization, malaya, malaysia, sequencing, teaching. Bookmark the permalink.